Each fortnight we’re throwing the spotlight on one of our products that can be specifically designed to fit your needs. This week we look at key features, optional extras and compliance and safety details in the GasVault range. Full structural certification and a 10 year structural warranty available on all GasVault units. All GasVault units are manufactured in conjunction with ISO 9001:2015 ensuring each product is made with highest quality guarantee. The GasVault standard range is coded using the ‘GSD’ tagline and our standard units range from a 1 GSD model up to a 48 GSD store. Fully bespoke design capabilities to satisfy specific site layouts and storage requirements. See our latest product run through video on YouTube. See specification detail on the 24 & 48 GSD models below. Construction: Robust fully welded 100x50mm box frame. Access ramp: Removable, non-slip access ramp for easy trolley entry. Cladding: Corrosion resistant Plastisol coated, box profiled zintec cladding panels fitted to sides and roof. Colour: Goosewing grey. Floor: Corrosion-proof aluminium checker plate flooring prevents rainwater from corroding the cylinder bases. Access: Twin opening sliding mesh doors with padlockable lugs. Steel finish: 2-coat corrosion resistant polyurethane paint finish. Choice of colours. Standard colour: Blue RAL 5017. Weatherproof: Solid cladded roof to prevent rainwater from corroding cylinder valves. Divider wall for segregation: Divider wall running down the middle of the store for segregation. Ventilation: Meshed door panels and louvred side cladding panels provide ample ventilation throughout the store. Lifting: Forkliftable frame underneath to allow for unloading and repositioning. Certified lifting eyes to for lifting by crane. Designed and manufactured in accordance with all gas storage regulations and industry best practice guidelines. Structural certification available on all Chemstore GasVaults. Roofs fitted to prevent rainwater corroding cylinder fittings and therefore helping to keep cylinder storage and operation safe. Raised non-slip flooring used in order to prevent ground water corroding cylinder bases. High quality and corrosion-free Aluminium checker plate flooring used to maximise life span of the stores. All cylinders are secured vertically using heavy duty chain restraints. This ensures the cylinder cannot fall even in the event of a fire or under high powered water jets from the Fire Brigade. Safety signage included as standard. All Gasvaults are fully padlockable to control cylinder access. Units can be coloured to match any site scheme required. Lead times of only 3-4 weeks for any unit. Shorter lead times available on request. 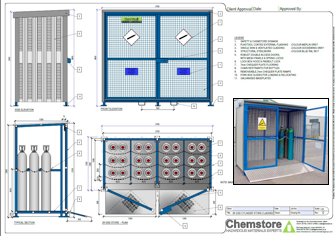 Why choose Chemstore GasVault solutions? Chemstore units are recommended by major Gas Suppliers throughout Ireland, the UK and the rest of Europe. Unlike civil structures, Chemstore products offer a fixed price solution to hazardous storage problems. There are no hidden costs such as architects, consulting engineers, planning fees and contributions. Chemstore units provide immediate, secure and safe storage for all flammable and hazardous materials from petroleum products and compressed gases to industrial chemicals. Chemstore units ensure compliance with best practice procedures, all relevant Health & Safety, Environmental, Fire Regulations and current legislation requirements. Lead times: Delivered to site 3-4 weeks from receipt of order. No site works: Units are delivered to site fully assembled and ready for immediate use. Flexibility: Stores can be easily relocated on site by forklift or crane at a later stage. Maintenance: Minimal maintenance will be required over the lifetime of the store. 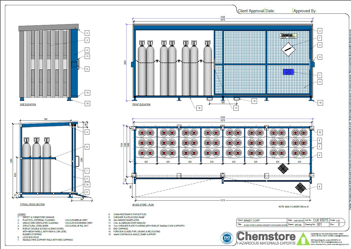 Options: All Chemstore units are manufactured to customer specification. There is no limit to the range of storage configurations and features that can be fitted to any Chemstore material store.